Volano Solutions creates custom software solutions to be used on the web. They’re all about helping their clients to create better workflows and efficiencies. 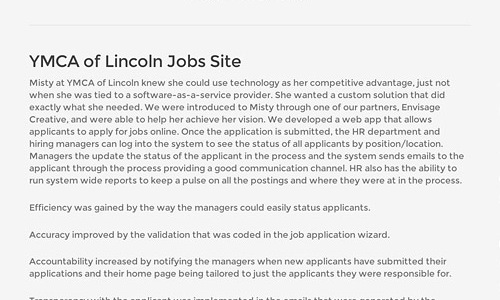 They have many projects under their belt, but there was not much information on their site about their process, or the thought behind the solutions they build for clients. Wheelhouse Collective brought me on this project to help them share the thought and strategy that went into creating a few of their recent projects. 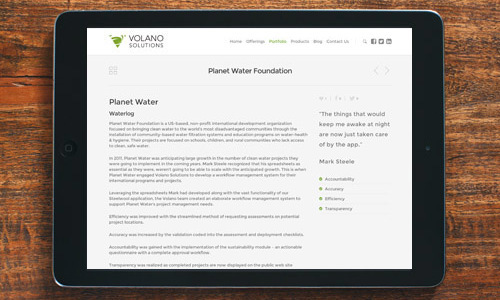 We identified a three projects and I wrote case studies that showcased how Volano helped their clients to work smarter: Planet Water, Peggy Bank, and YMCA of Lincoln. I interviewed Volano staff about the client’s need and the custom solution that Volano created. We also included testimonials from the client. I used a straightforward and slightly serious voice. The folks at Volano are very intelligent so we wanted that to come across, but we also needed to make it approachable for the non-techy reader. We also wanted the case studies to read as results-oriented to reflect the high value that Volano places on the outcome of their products.